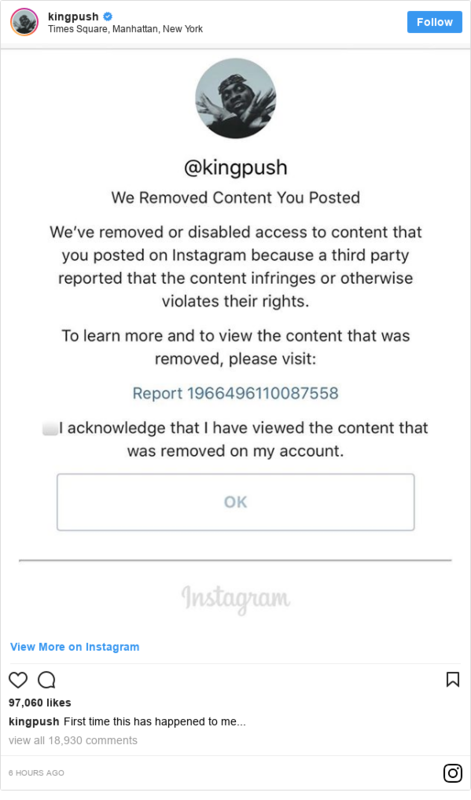 Pusha T has released a new track taking aim at Drake while posting a photo appearing to show the Canadian rapper in blackface.The photo was originally used as part of a promotion for a clothing line called Jim Crow Couture from Canadian fashion label Too Black Guys.Pusha T used it to promote The Story of Adidon - the latest in a line of diss tracks between the two rappers.He was responding to Drake's track Duppy Freestyle, released on Friday.The photo Pusha T posted appears to have been removed by Instagram. It seems that a lot of people didn't know about the image - reportedly from Too Black Guys' 2008 ad campaign. Van Lathan, who became known for challenging Kanye West after the rapper suggested that slavery was a choice, couldn't believe it either. WAIT. SO THE PICTURE OF DRAKE IN BLACKFACE ISNT PHOTOSHOPPED!!!??????? One user compared it to Kanye's recent pro-Trump tweets - including one where he wore a Make America Great Again cap. Some even suggested new lyrics for Drake's comeback track. The Story of Adidon uses the beat from Jay-Z's song The Story of OJ - which features cartoon images referencing minstrel shows and blackface in its video.In the track, US rapper Pusha T touches on Drake being mixed race, his producer having multiple sclerosis and a rumour that Drake is fathering a secret child.He raps: "Confused, always thought you weren't black enough/Afraid to grow it 'cause your 'fro wouldn't nap enough. "Drake has spoken before in his songs about the issue - in 2015's You & The 6, he says: "I used to get teased for being black/And now I'm here and I'm not black enough". After Drake dissed Pusha T's producer Kanye West, Pusha T took aim at Drake's producer Noah Shebib. Also known as 40, Noah Shebib has MS and is an ambassador for the National Multiple Sclerosis Society in the US.Pusha T raps: "OVO 40, hunched over like he 80, tick, tick, tick/How much time he got? That man is sick, sick, sick".The producer appeared to respond to the line on Twitter, posting that 30 May is world MS day. Pusha T also fuelled rumours that Drake has a secret child with an artist and former adult film actress. "A baby's involved, it's deeper than rap/We talkin' character, let me keep with the facts/You are hiding a child, let that boy come home".He adds: "Adonis is your son/And he deserves more than an Adidas press run, that's real/Love that baby, respect that girl/Forget she's a pornstar, let her be your world". The lyrical beef between Pusha T and Drake goes back a few years, and appears to stem from a disagreement between King Push and Drake's one-time mentor Lil Wayne. Pusha T chose to reignite the row on his new album Daytona, which was produced by and features G.O.O.D. Music label head Kanye West. On its final track, Pusha accuses Drake of not writing his own lyrics.It's an allegation he repeats in The Story of Adidon: "Drug dealin' aside, ghostwritin' aside/Let's have a heart-to-heart about your pride".Newsbeat has contacted representatives of Drake, Too Black Guys and photographer David Leyes for comment.Follow Newsbeat on Instagram, Facebook and Twitter. Listen to Newsbeat live at 12:45 and 17:45 every weekday on BBC Radio 1 and 1Xtra - if you miss us you can listen back here.